OEM Ammunition | Ammo & Bullet Mfg. Inc.
Manufacturing your own ammunition products can be expensive and time-consuming. For you to create quality products, you need to invest in high-grade materials and state-of-the-art equipment as well as train personnel for the job. To cut down expenses and speed up development time, you may tap on the services of an OEM ammunition provider. If you are looking for an OEM ammunition partner, trust only Ammo and Bullet. Our company manufactures high-quality, official ammunition for the military, law enforcement, and private companies. We use high-quality materials and state-of-the-art machines in creating our ammunition products. We specialize in contract manufacturing, private label, and OEM ammunition. Contact us in case you need help in outsourcing your products. Our company can help you keep up with the growing demand for your products. At Ammo and Bullet, we treat our customers as partners for OEM ammunition. 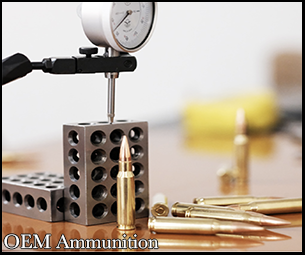 Our company has worked with various businesses and organizations for OEM ammunition. We follow our client’s specifications closely when it comes to creating and packaging ammunition. To read about our mission, click here. We produce different rounds starting from 9mm up to .338 Lapua. Clients may choose from our various ammunition rounds, such as 9mm, 45 Auto, .300 Blackout, .223/5.56, and .308/7.62×51. Never compromise quality just to lower production expenses. Check the quality of products made by an OEM ammunition partner. At Ammo and Bullet, we perform a series of official quality checks for our ammunition. For example, we use laser sensors to check the powder levels of our bullets. Optical micrometers are also used to inspect case gauges, bullet seating, and cartridge length. After the automated check, our technicians will manually check for any possible defects on our bullets or cartridges prior to shipment. Make sure your OEM ammunition partner has your best interests in mind. The company must be open to working with you side by side in creating products to help you with your business. Technicians and specialists who work on OEM ammunition must be willing to understand your unique needs and help you find a solution for your business. Consider also the confidentiality of your trade secrets before forging a partnership with a provider of OEM ammunition. Make sure the company will protect all information given to them. Consider an OEM ammunition partner that has thorough knowledge of the market and a deep understanding of your business. Check if your partner has manufactured or developed similar products in the past. Looking for an OEM partner and establishing a relationship may be daunting, especially if you will do it for the first time. That’s why it’s important to allocate time in finding the right OEM ammunition partner. You may communicate with different companies to find the best OEM ammunition partner for your business. Compare what these companies can offer. Nothing beats seeing things firsthand. If possible, set up an appointment for a factory visit with a company. Here you will learn how they operate as an OEM ammunition partner. This will allow you to observe the processes and the practices in their facility. You may gauge whether they are up to your standards for an OEM ammunition partner. This may be challenging if you outsource overseas. Fortunately, providers of OEM ammunition like Ammo and Bullet develops and manufactures products here in the USA. Looking for an OEM Ammunition Partner? Get in Touch With Us. Trust only Ammo and Bullet if you are looking for a trustworthy and reliable OEM ammunition partner. Contact us to learn more about our company and our products. We look forward to serving you as an official OEM ammunition partner. We are Ammo and Bullet, an ammunition manufacturer based in Arundel, Maine. Our company develops and produces high-quality ammunition for the military, law enforcement, and businesses. We are proud to offer ammunition assembled using top-notch materials and state-of-the-art equipment in the USA. Since we value the lives of the people who use our products, we pay close attention to detail, particularly during our premium, quality control process. After the automated check, our ammunition is packaged in its cartridge. Technicians will examine possible defects before shipping our products. Our company also performs tests on random samples and checks component dimensions prior to loading. For our manual checks, we examine powder level, bullet seating depth, primer depth, and overall length, among others. Our lab technicians perform validation for handheld measuring scales and instruments. They also calibrate our test barrel sensors to make sure they meet the requirements of Sporting Arms and Ammunition Manufacturers’ Institute (SAAMI). We have a machine room supervisor who will examine the in-line process measuring devices and make certain that all quality procedures are implemented on both the bullet and cartridge. Consider our company as your organization’s own manufacturing team. Different organizations and businesses have approached us as your manufacturer for private label ammunition. We load and package your ammunition based on your specifications. Trust our company when it comes to ammunition development. Feel free to choose from some of our most popular rounds, including 9mm, 45 Auto, .300 Blackout, .223/5.56, and .308/7.62×51. We produce different rounds starting from 9mm up to .338 Lapua for a variety of manufacturers. Our company aims to be one of the manufacturers for the military. We believe that reliability is a necessity, especially when lives are on the line, and that’s why we are dedicated to providing high-quality ammunition. We offer premium, quality rounds designed for any military mission. For special situations, we also create custom ammunition. For information on why federal bureaucrats are buying guns and ammo, read this: https://www.forbes.com/sites/adamandrzejewski/2017/10/20/why-are-federal-bureaucrats-buying-guns-and-ammo-158-million-spent-by-non-military-agencies/#7a0ca89b64a1.